The PGA Tour is doing Tiger Woods' recently-repaired back no favors this week. They paired Big Cat with two of the longest drives on Tour, and you know he's going to want to keep up with them all week at the Genesis Open at Riviera Country Club. Woods will go with Rory McIlroy and Justin Thomas at 10:22 a.m. ET on Thursday and then at 3:03 p.m. on Friday. Woods revealed on Tuesday that he actually flew to the tournament with Thomas (or maybe it was the other way around), and he's enjoyed what McIlroy has done to start the year in Abu Dhabi and Dubai. He also noted that he would have no issues with turning on his newfound pals once they're all in contention on the weekend. He was kidding, sort of, but it did paint a fascinating picture of what could be if Tiger is rolling alongside some of the best in the world. Here's a look at the four best groups as well as their tee times on the first two days of play at Riviera (all other tee times can be found here). 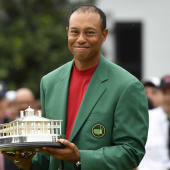 Tiger Woods, Justin Thomas, Rory McIlroy -- 10:22 a.m. | 3:02 p.m.
Matt Kuchar, Phil Mickelson, Tommy Fleetwood -- 10:32 a.m. | 3:12 p.m.
Patrick Cantlay, Jordan Spieth, Kevin Chappell -- 3:02 p.m | 10:22 a.m.
Dustin Johnson, Bubba Watson, Adam Scott -- 3:12 p.m. | 10:32 a.m.
All four of these groupings will be featured on PGA Tour Live on Thursday and Friday. Those are some outrageous pairings this early in the year in which is a fantastic exclamation point to the West Coast swing. Watson, by the way, luckily got an early tee time on Friday because he has a date with the NBA All-Star Celebrity Game on Friday evening. He said he's prepared to pull out of the golf tournament to make the basketball game. Hopefully for him it won't rain.